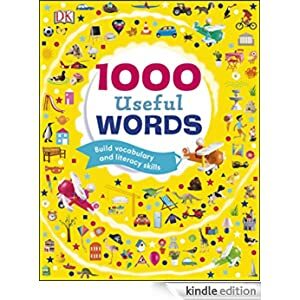 This exciting collection of 1,000 Useful Words will broaden young children’s vocabulary, and strengthen their early reading and writing skills. Arranged thematically, topics include Me and My Family, Animals, How We Look and Feel, Around the World, and I know…Colors, Shapes, Numbers, Weather, and Seasons. There are also four “story style” spreads that tell a simple narrative and inspire storytelling skills: for example, All in a Day is about a young child’s typical day, and If I Were a Pet looks at a dog, cat, rabbit, fish, and pony, and imagines what these different animals might like to do. This book is for readers ages 5-8 and is selling for $1.99 today.